What is Thor and why is it such a valuable mining asset? The Thor resource is a collection of 27 historic Crown grants and over 3,172 hectares of mineral cell claims, all 100% owned by Taranis Resources. Five minor historic precious and base metals mines have been amalgamated into Thor; Broadview, Great Northern, True Fissure, Blue Bell, and St. Elmo. These operated between 1898 and 1973, and were handicapped by the terrain, logistical problems, and archaic metallurgy. 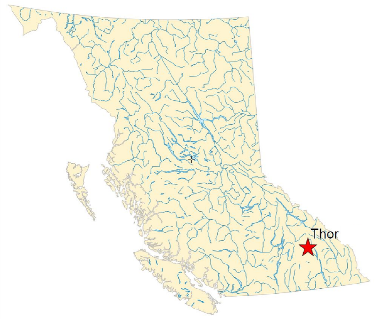 The mines constituting Thor were classified as strategic metals reserves at the time of WWII. It was long theorized among the original explorers of the deposit that all of the mines were situated on a single horizon, and Taranis Resources has confirmed this through drilling, geophysics, and other types of exploration work. New technologies and mining methods will enable Taranis to fully develop the deposit in a way once thought to be science fiction (Newton Emmens, "The Mining World" May 7, 1910). Early and extensive test work has confirmed the effectiveness of gravity processing. Compared to historical applications of hydrometallurgy or removal of high-grade ore for off-site processing, this relatively new method will reduce environmental impacts while drastically improving project economics. Taranis Resources is proud to develop in British Columbia. Compared to global mining jurisdictions, the area is politically stable and has a long history of mining activity. The majority of the deposit is accessible using open pit methods, with large amounts of ore located directly at surface! The efficiency of modern mining techniques and high level of mining development at Thor make it an outstanding investment opportunity, with relatively minor exposure to any one metal price on account of its polymetallic ore.
Thor is a highly complex deformed and faulted polymetallic sulfide deposit. The ore-bearing horizon is stratabound and folded within the Thor Anticline structure. Thor has numerous parallel horizons that extend 2-4 km along its northwesterly strike. Primary mineralization is found within a tabular unit called the Combined Metals Unit ("CMU") that contains tetrahedrite, galena, chalcopyrite, pyrite and sphalerite. The chief metals of interest are silver, gold, lead, zinc and copper, but other elements such as scandium, indium, and large amounts of rubidium are also found in the polymetallic ore. The Thor deposit occurs within the historic Silver Cup Mining District which includes a number of other mines including the Silver Cup, the Nettie L., and more that were mined extensively in the early 1900's. Thor remains the only resource that has not seen extensive mining, and the resource remains intact in the ground making it a very attractive near-term project. There are a number of processing opportunities in the area that are currently being evaluated. Rugged terrain and a wide variation in climate characterize the Kootenay Region of British Columbia. Historic mining activity at Thor encountered considerable challenges. One of the crucial aspects of any ore deposit is the continuity of the mineralization. At Thor, the sulfide mineralization is tabular and is known to extend for 2+ km. This portion of the deposit was drilled-off on 40 m spaced sections and constitutes all of the Resource included in the NI 43-101 assessed by RPA.